Happy Monday! I hope you guys had a great weekend. It was a humid and sticky one for us so we spent most of it inside. Despite how wonderful it is to be out in the heat, it is not forgiving to two-year olds. He gets overheated and cranky so we go out in bursts with lots of water. 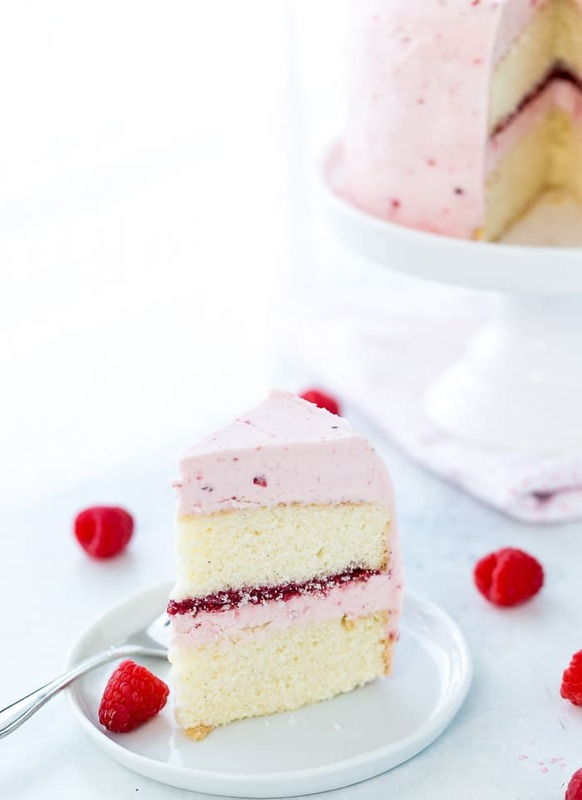 I had time this weekend to redo pictures of this vanilla bean raspberry layer cake. It’s an oldie but favorite! 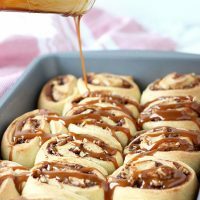 The original post sharing this recipe was published in 2013 but the pictures were horrendous. 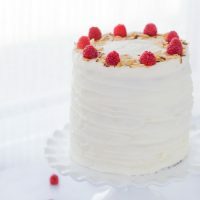 To do justice to this moist, soft vanilla cake filled with sweet raspberry filling and topped with raspberry frosting, I remade the recipe and took new pictures. It now looks as it should; a summer perfect cake! I’m a sucker for vanilla cake and you can never have too many favorites. Back when I was starting to teach myself to bake, I was on the hunt for the perfect vanilla cake. 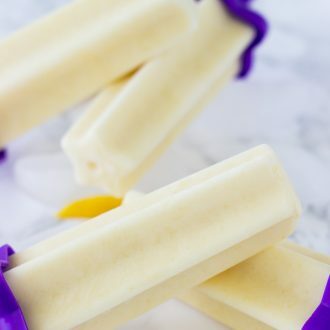 This recipe from Sweetapolita caught my eye and I had to try it. I used her cake recipe here as it became one of my favorites. 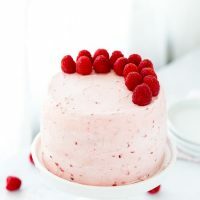 It’s tender, rich in vanilla flavor thanks to using vanilla bean paste and it is paired with an equally whipped vanilla frosting. 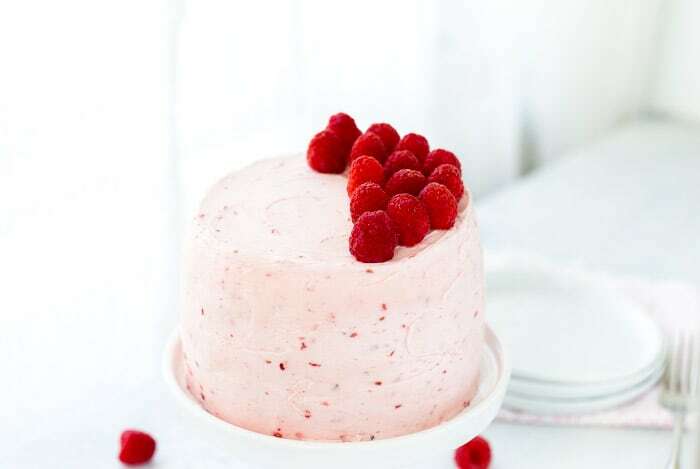 For the touch of summer, the cake is filled with a raspberry compote. I used some of the compote in the frosting and as you can see I didn’t strain the seeds out. I love the look and touch of seeds. But feel free to strain your compote before filling your cake. 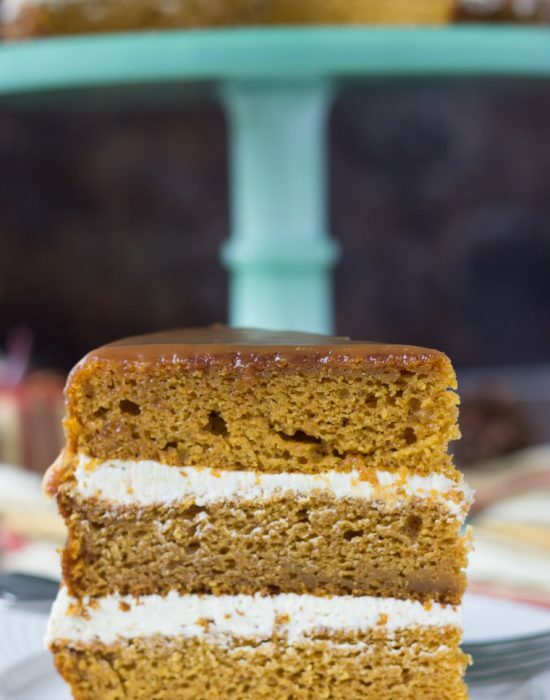 This cake is truly a classic and one that you must try. It’s perfect for birthdays and showers. Let me know when you try it as I would love to hear what you think. 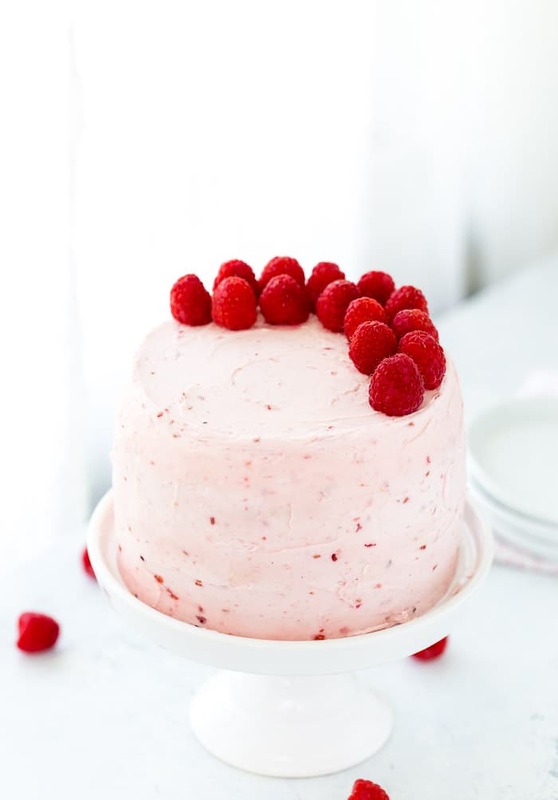 A classic Vanilla Bean Raspberry Layer Cake with moist vanilla bean cake with a sweet raspberry filling and a fluffy whipped vanilla bean frosting! Preheat oven to 350 degrees F. Grease and line two 8-inch round cake pans with parchment paper circles. Grease parchment and set aside. Whisk together a third cup of the milk, egg whites, egg, lemon extract and vanilla bean paste. Add the butter one piece at a time and blend on low speed for 30 seconds. Then add the remaining milk, and mix on low speed until moistened. Increase speed to medium and mix for 1½ minutes. Be careful not to overmix. Scrape the sides of the bowl as needed. Add the egg/milk/extract mixture in 3 separate batches mixing on medium speed after each addition until combined. 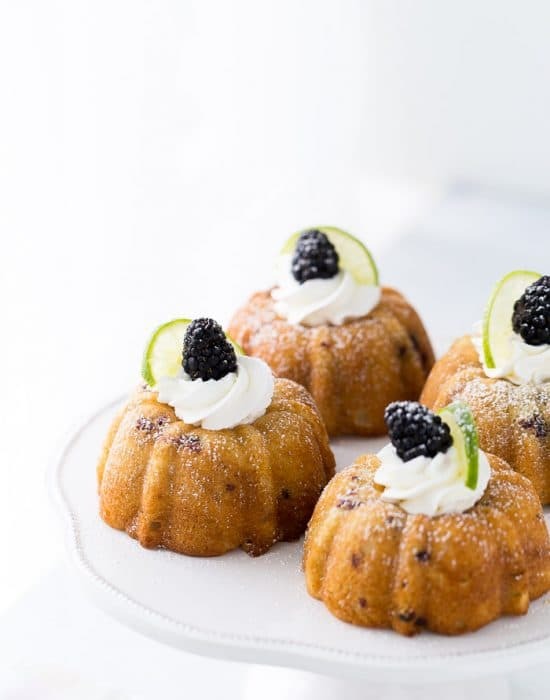 Pour batter into prepared pans and bake in the center of the oven for 20-25 minutes or until a cake tester comes out clean when inserted in center of cake. Let cakes cool in pans for 10 minutes before removing and cooling completely on wire racks. Combine all the ingredients in a medium saucepan and heat over medium heat until the berries start to break down, about 10 minutes. Stir often. Lower heat and simmer until the compote thickens enough to coat a spoon, about 15 minutes. Let cool. Pass through a fine seize if you dislike the seeds. Add the rest of the ingredients and mix on low speed for 1minute. Then increase speed to medium and mix for 6 minutes until the frosting is very light, creamy and fluffy. Add in 1/2 cup raspberry compote to frosting and beat until whipped. 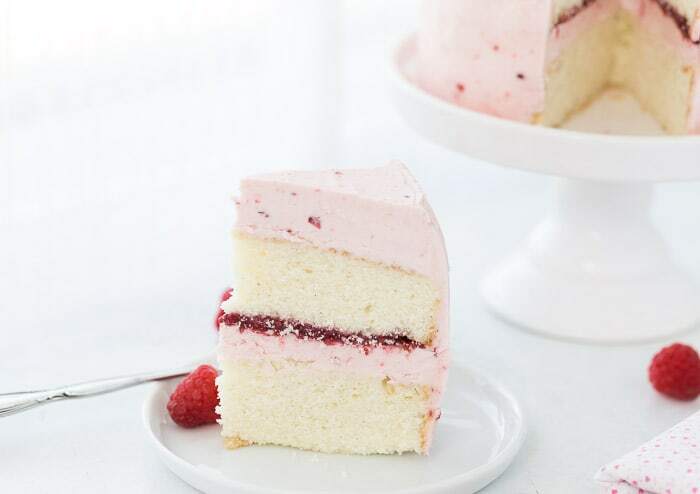 To assembly the cake, slice each cake to have 4 layers. On a cake plate, place the first layer of cake. Add about a half cup frosting and evenly spread over the cake. Add half of the compote and spread. Repeat with the rest of the layers. Finally top with the last cake layer. Spread frosting over the top and sides of the cake. Smooth frosting and decorate as desired. I love the octopus! 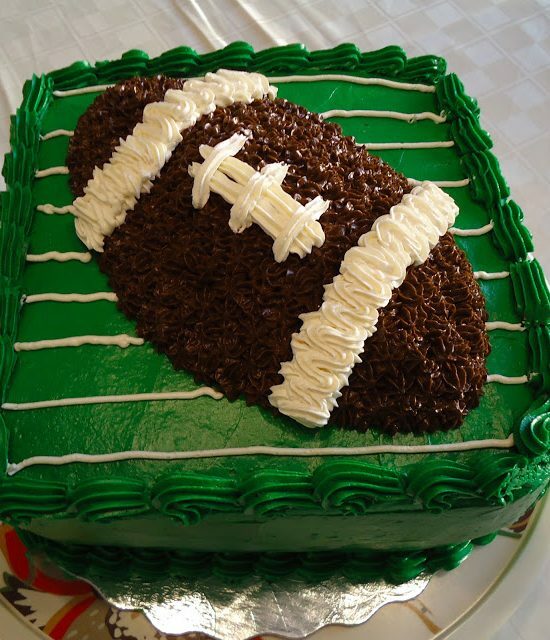 What a great cake! Thanks! Icing in between layers always helps to keep things together lol! Hi Jodi! I mean on the same layer but you can do alternate if you choose. 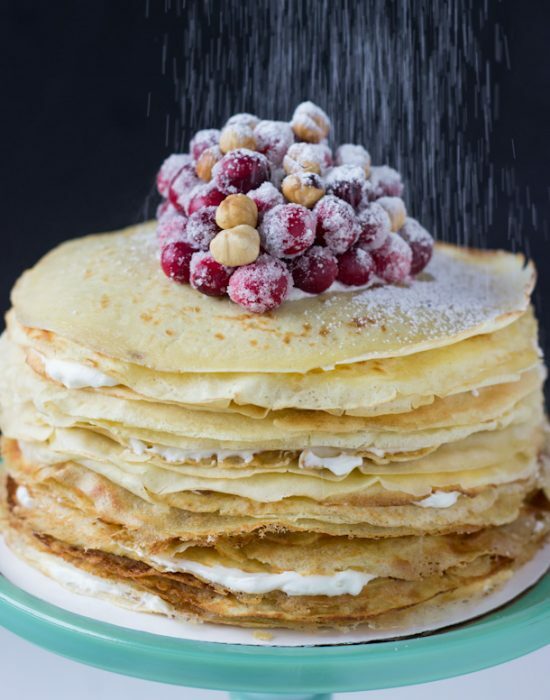 I usually do both on one layer…usually the buttercream first and then compote. Can you substitute vanilla bean paste for vanilla extract? Or will that change the consistency or the outcome of the cake ? Hi Summer! 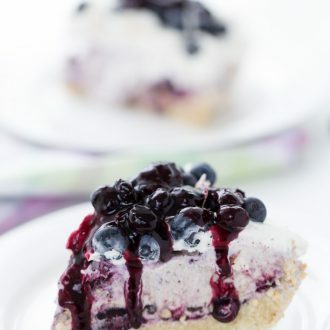 You can substitute with vanilla extract. 1:1 substitution will not affect the consistency of the cake. Is it really 1 1/4 TAbLEspoons of powder?